Coles Whalen knows how to jumpstart a music career, literally. After independently releasing an EP in 2005, she bought a pick-up truck and camper and never looked back. She toured constantly through the US and Canada, released 2 follow - up full length records, and sold more than 13,000 CDs right out of the back of her truck before landing back in her hometown of Denver, CO in early 2009. 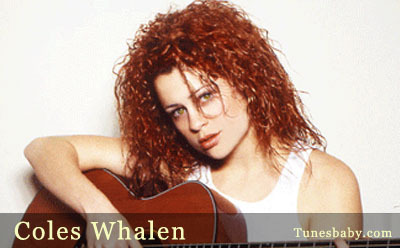 Not slowing down, Whalen made frequent trips to Nashville, TN, immersing herself in the songwriting circles of music city, while continuing to conquer the road. She has appeared with Hip Hop super star Akon at his Hitlab Showcase in Montreal, Canada and opened for Joan Jett, Pat Benatar, Paula Cole, The John Butler Trio, Rufus Wainwright, Reckless Kelly and others. 2011 looks promising for this young songwriter as she prepares to release her much anticipated 4th CD, recorded in Nashville – TN, with producer Michael Flanders. Ricardo Baca, Pop Music Critic for The Denver Post wrote “Whalen delivers an absolutely great show, she left a lasting impression on me.” Come see for yourself.